vitamini handmade: Shop handmade this holiday! Ever since I opened up my Etsy shop back in 2008 my concept of holiday shopping has changed. When I started receiving my first holiday gift orders, I started thinking about all of the people who would be getting something that I made with my own two hands, how I worked out the design in my head, drew it with a pen and paper, and finally screen printed it with a screen I stretched and exposed myself. I thought about how much more meaningful a handmade gift is, opposed to something mass-produced off the shelf at a big box store. Ever since that first holiday season, I decided to shop handmade for the holidays. There are so many wonderful small businesses out there and it feels great to feel like I'm supporting them and their work, instead of adding to the wallet of a big corporation. 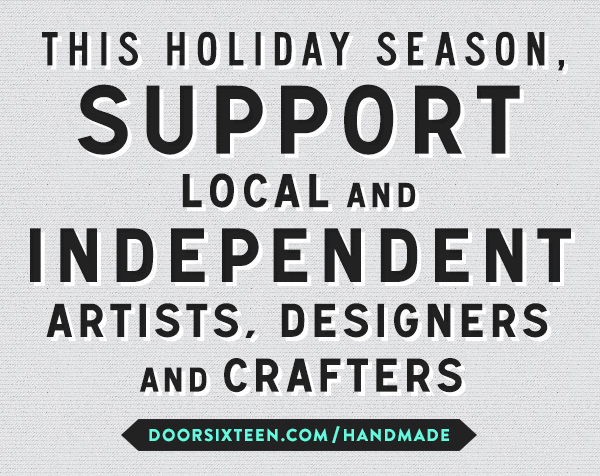 Door Sixteen compiled a huge list of handmade businesses on this blog post. Many have coupon codes attached, too! It's not too late to do your online holiday shopping, so get on it! 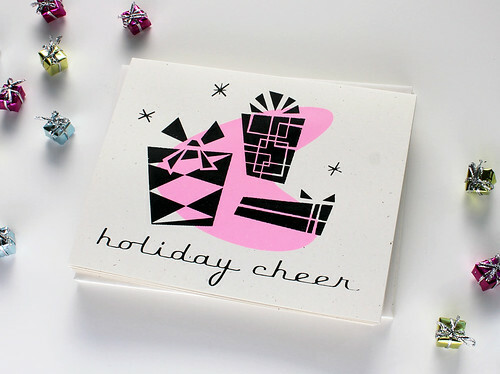 *photo above of my Holiday Cheer hand screen printed card available in my Vitamodern shop.